To actually begin using the Inspector, we need to first click on something in the preview area. If you read through the interface introduction article, you may recall the observer that we talked about. 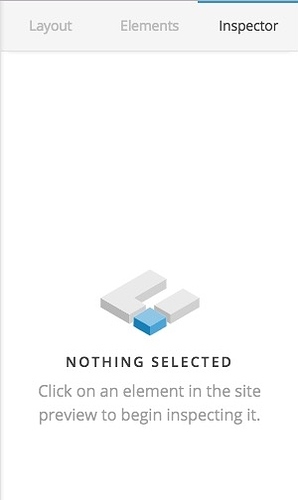 This is the blue outline you will see as you hover over inspectable elements in the preview area. Anytime you see this blue observer hovering over an element you’re about to click on, you will know it’s something you can interact with in Cornerstone (also take note that the blue color of the observer ties in with the same blue used throughout the Inspector pane). The observer will also give you some useful information on the label about the element you’re about to click on. Direct Inspection – As mentioned previously, you can sometimes click directly on these elements depending on how you have setup your structure and child elements. Sections are usually clickable due to their padding, but rows and columns are not always readily available due to their child elements. In that case, you’ll want to use one of the other two methods we have to get to them. 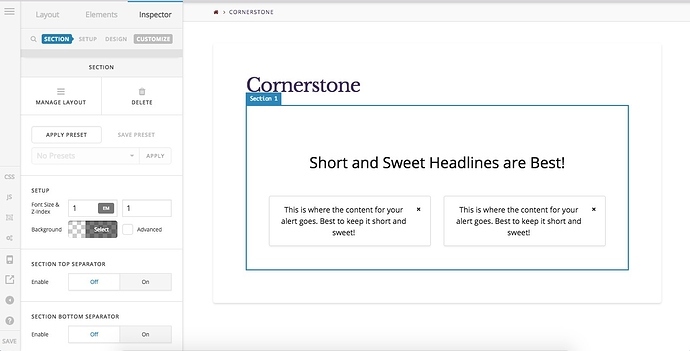 The Layout Pane – Another way you can get to these elements is to go to the Layout pane and click on the section you’re interested in. Once you’re in there, you can inspect the current section by clicking the search icon. To access the rows you will need to click on the arrow icon of the search sortable control. Additionally, you can inspect rows by clicking the search icon on the row sortable control. Finally, you can inspect columns by simply clicking on their sortable control at the bottom of the subpane. Element Breadcrumbs – Finally, you can utilize the element breadcrumb path at the top of the Inspector pane to get to parent columns, rows, or sections. These appear directly below the Inspector heading and are dynamic depending on the element you’ve selected. As you go deeper into that section, the path upwards will be revealed. For instance, if you click a Headline on a page, you will see buttons to move upwards to that element’s parent column, that column’s parent row, and that row’s parent section. You’ll see some images of these breadcrumbs in action later. We’ll take a moment to go through these items one by one. First, the “Inspector” title has been swapped out for the name of the element you’re currently inspecting (in this case it’s our “Section”). Directly below that are our element breadcrumbs. 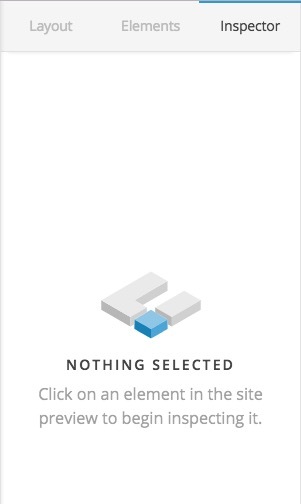 Since a section is the highest level element available, it simply acts as a label for now and gives you the title of the current section you’re inspecting. You can see that our second row of the “Get in Touch” section is highlighted for us already, so we can instantly move our columns back and forth as needed or make any other adjustments we see fit. The next action button for sections, rows, and columns will always be a “destructive” action. So for sections and rows that means it will be a “Delete” option, and for columns, it will be an “Erase” option, which will erase the contents within a column (you cannot delete columns as they are key to the structure of a page). With all other elements that you inspect, the actions available here will always be to “Duplicate” and “Delete,” so you can use these for quickly adding lots of the same element over and over to a page, or you will need to go here to remove elements as needed. After our actions, we have our control list. Certain elements will share similar control structures whereas others will have some that are completely unique just to them. The great thing about Cornerstone being a live builder is that you can simply play around with these controls and see what they do in real time to give you a sense of how you want things to look. It should also be noted that if you click on the Customize tab at the element breadcrumbs you will see inputs for CSS IDs, classes, element CSS and inline styling appear. You can use these to make fine-tuned adjustments to things as needed. After doing that, you’ll see some things in the Inspector pane have changed once again. Our title has been swapped out to convey that we’re currently inspecting a Headline. Directly above that title, we can now see that we have a full path of breadcrumbs leading up to our parent section. Clicking on any of those breadcrumbs will allow you to inspect that element. So if you were to click up the path, once you select the column, that breadcrumb will disappear and only “Get in Touch” and “Row 1” would remain, and so on and so forth. Also, our action buttons and controls have swapped out as we expect them to. We can now duplicate or delete this element, as well as alter items regarding its appearance such as the text itself, heading level, stylistic accents, et cetera.